The newly elected Berejiklian Government has wasted no time amalgamating environmental departments and watering down environmental protections — aiding, effectively, the extinction of species, writes David Paul. After her calls to "let's get it done" and make New South Wales "the best it can be”, it was a very telling move by the newly elected Premier of NSW, Gladys Berejiklian, to remove two departments and place their functions entirely under two new "super-departments". Effectively, there are now only eight departments in NSW – a remarkable concentration of power by any Australian standard – and no hint at all that this priority move was on the books prior to the recent NSW State Election, given the surprise shown my departmental managers and staff. Uncertainty still clouds the implications of subsuming a government department under a consent authority umbrella with senior and junior ministers — though, the chain of authority would indicate the new Environment and Energy Minister, Matt Kean, would be without an independent voice and, would more likely, have to toe the line when it came to development approvals. This is pertinent with a number of high profile mining and gas approvals poised for approval or rejection in NSW currently before the Department of Planning, now re-named the Department of Planning and Industry. This new amalgam of ministerial interest, bringing together potentially conflicting pieces of legislation, is what the Berejiklian Government means when it says it is "streamlining" or making things more "efficient". But if considered with the history of legislative and policy reforms over the last eight years, particularly in relation to the environment, planning and development, these things have been said before. The Office of Environment and Heritage is a large department containing the National Parks and Wildlife Service (NPWS). But this agency has been subject to repeated funding and staffing cutbacks over the last eight years, such that the total budget has decreased by $80 million in two consequent budgets by the Baird Government. As such, the capacity of the NPWS to properly manage its current estate has been compromised, leaving open a number of private operators to start making a few bucks. Leaving the environmental managers short-staffed is a tactic which results in the agency open to more criticism for being poor managers — and so the cycle continues. But the NSW Planning Department specialises in legislative and policy hocus pocus in order to roll out the mining and housing development with the general intent to increase approval turnaround speed and reduce issues. A crucial moment in the development approval process in NSW was the Warkworth Coal Mine Expansion – which was knocked back in the Land and Environment Court for a variety of social and environmental reasons – with the local endangered community a key issue. The NSW Government’s response was swift — to deprive the public of "merit appeal rights" in the court by the establishment of a supposed "independent" planning commission, which would hear the merits of any major project, provided there were enough objectors. "Independent", of course, but still under the same planning minister. Several iterations since the commission was first established have seen the scope and recourse for public input reduced. This is still the case in NSW. Another bold move by the planning minister of the time was to put economic considerations clearly above social and environmental ones when considering development applications. However, the howl of indignation from the public and commentators saw this policy eventually rescinded. legislative, administrative and policy flux through a series of new guidelines and rules, and organisation re-structures in the environment area over the last eight years, as Gladys recently announced. 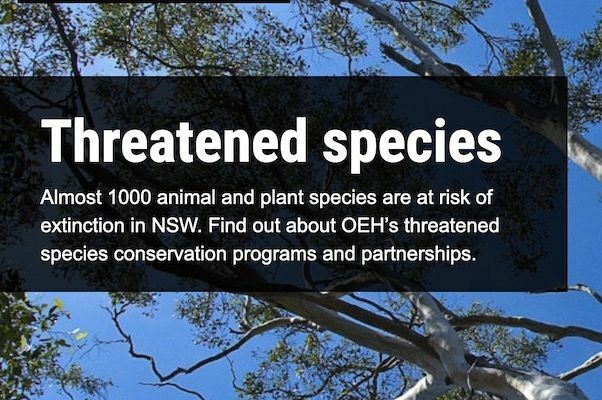 Of course, the Berejiklian Government has substantially changed the environmental laws in NSW in a significant overhaul in 2016, dropping the Threatened Species Conservation Act and the Native Vegetation Act resulting in much weaker assessment and environmental protection powers on private land in particular, with a massive expansion of the self-assessment system and clearing loopholes. This is all at a time of serious declining biodiversity and land condition across the state. An issue the Planning Department has spent some time on is how to bring the triple bottom line components (environmental, social and economic) together into one measure of relative value. In theory, this would add robustness to the approval process and make it less susceptible to legal challenge. However, the method adopted was the use of "choice modelling" — a type of cost-benefit analysis where, rather than ascribe an intrinsic value to a matter, say a particular creek in terms of environmental services it provides, this method gives a dollar value only to public perceptions of environmental and social outcomes, obtained by the use of community surveys. Offset policies have been a failure in terms of delivering real environmental gains, as this has never been substantiated. It is the general consensus within the scientific community that, rather than delivering good outcomes, offsets have only been successful at turning public perceptions to one of acceptance for significant environmental loss. The pattern, however, seems to be clear: reduce accountability for environmental impacts and any legal recourse the public may have. One has to ask the question: is the NSW Government gearing up for an onslaught of unpopular development? New onerous changes to trespass laws have also been flagged by the Liberals — another worrying sign of impending social turmoil. But is this really a war on the environment? If so, it would imply a coordinated and substantial effort over many years — something ingrained in the culture that would allow such deliberate obfuscation of public responsibility. Recent whistleblower resignations have rocked the Planning Department and point to the fact that all is not well. Despite calls for the Department to be investigated for some of the "dodgier" approvals that have surfaced, there is nothing in the recent announcement of this significant restructure in the bureaucracy by Berejiklian to suggest anything will be scrutinised. As whistleblower revelations have suggested, there is a lot to hide. From my own dealings with the Planning bureaucracy, there were, certainly, individuals who seemed taken with the idea that the aim of planning is to ignore and whitewash impacts and consideration of the environment as much as possible. As a regulatory officer with the Office of Environment and Heritage (2013-15), a source of contention that kept being raised with me was the threatened species and ecological communities. Well, apart from being enshrined in legislation, these things certainly do bother the hell out of mining executives. I remember one mining exec telling me he would like to "gouge the eyes out" of an ornithologist for having the temerity to report seeing a couple of Regent Honeyeaters – "money-eaters", as he called them – on his mining lease. This complete disrespect for the environment (and our human rights, as a consequence) is not pretty to encounter firsthand, but even less pretty seeing it reflected in the dealings of the public consent authority. Another way of understanding this issue is the fact that the approach in NSW – and Australia more generally – of reducing the operation, size, power and effectiveness of that part of the bureaucracy dealing with the environment has also been undertaken by the Australian Government with a 30 per cent reduction in the Federal department workforce and a privatisation of its functions. This has also happened in the U.S. with the significant repeal and winding back of important environmental protections and functions since the Trump presidency began. Coincidence? It is more likely that these patterns reflect a growing "libertarian" or "neo-conservative" trend in some western democracies — one that advocates for less government, less regulation, less taxation and less democracy. The taxation objective has already been achieved with the biggest corporates paying no or little net tax today, but it is the twilight years for the fossil fuel sector and this is the end game. However, they’re not ready to lose their grip on the old ways of making money just yet. end the grip of big money over our political institutions. These are not mutually exclusive and need to be done tomorrow. Our koalas cannot wait. David Paull is an Australian ecologist. You can follow David on Twitter @davesgas.